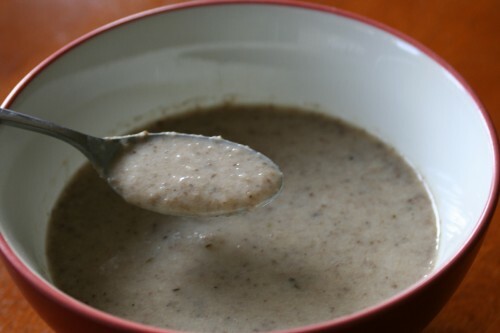 However, when I think of cream of mushroom soup, I usually think of the condensed variety served up from a can, and used in quick casserole cooking. Not terribly appetizing to me. But, when I found this recipe, I knew I had to try it. My husband and I both loved it. It's already been repeated and there are plans to make another pot this week. Heat the oil in a soup pot over medium heat. Add the onion and cook, stirring occasionally, about 4 minutes. Add the garlic and cook, about 1 minute. Add the mushrooms and cook until they release most of their liquid, 7 to 8 minutes. Add the broth and thyme and bring to a boil. Reduce the heat and simmer for 10 minutes. Stir in the wine, salt, and pepper and cook for 3 minutes. Turn off the heat and cool slightly. Using an immersion blender, puree the soup until it is mostly smooth. (Alternatively, in 1 c. amounts you can blend the soup in a blender.) Stir in the cream and warm through.